Spring is almost here and Morimoto Asia at Disney Springs will be welcoming the blossoming season with the first ever Sakura Festival, celebrating the flowering cherry blossoms with a series of events, special “Instagram-worthy” decor and themed menu specials. 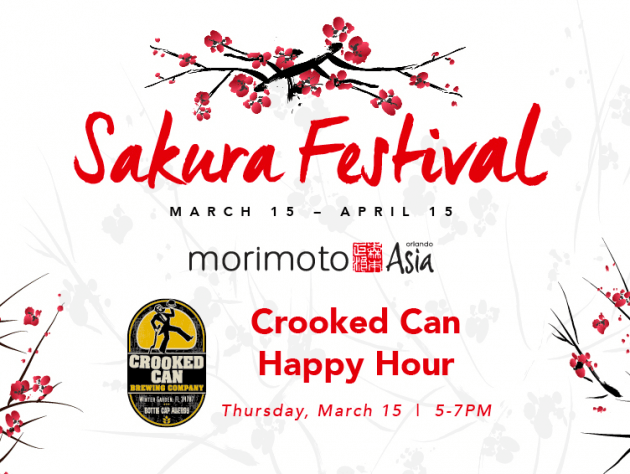 The monthlong festival will kick off on March 15 with a special Happy Hour event from the brewmasters at Crooked Can Brewing Company. The event will feature Crooked Can’s Sakura Kolsch which is only available at Morimoto Asia, paired with Pan-Asian bites. The Sakura Festival will continue through April 15. Get your tickets for the Crooked Can Brewing Company Happy Hour event on March 15 here.